This article elaborates on the basics of building applications with the Hybrid UI components in Kendo UI. While some mobile HTML frameworks focus on providing a one-size-fits-all experience, the Kendo UI hybrid framework focuses on delivering perfectly tailored experiences for different mobile platforms. Built and packaged correctly, the goal of such an application is to be virtually indistinguishable to end-users from a native SDK app. Application—This is the shell of Kendo UI hybrid apps. Application manages all navigation, application history, loading views, rendering mobile meta tags, and other essential mobile app tasks. Layout—Defines the reusable portions of a hybrid app, similar to a MasterPage or template. Layouts are often used improve app maintainability by defining things used across multiple views, like navigation. While not required, layouts are encouraged to use. Views—Individual pages of a hybrid app. Views contain the greater part of the application content. Every application has one or more views. Kendo UI hybrid apps can be created by using simple HTML pages. First, try creating a page called index.html using the code from the example below. 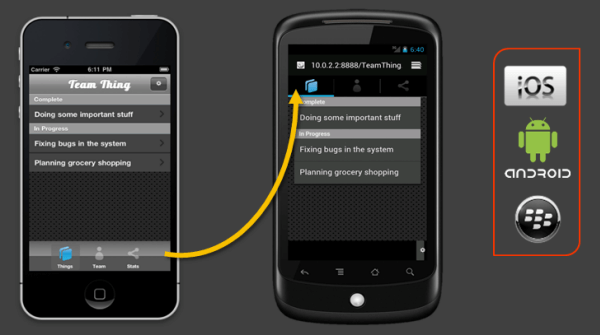 The Kendo UI hybrid Application automatically adds mobile meta tags for you at runtime. This example uses the minified versions of Kendo UI scripts and styles that include all features, widgets, and themes. You can create customized and more compact versions of the Kendo UI resources for your app if you choose not to use specific features or widgets. For development, the all minified files are the best choice. Find out more about installing Kendo UI in your project this article section. The layout is the template of your application. The whole content from views, which you are to create later, are going to be rendered inside of the layout, or layouts—you can define as many layouts as you need. A layout can contain anything, but generally it is where your app title bar and navigation are going to live. Add a layout to your app with the basic elements demonstrated in the example below. When the Application is initialized, this block of HTML is going to be initialized as a Kendo UI Hybrid Layout. The data-id attribute is further defined to give this layout a unique name that can be used by your views. Next, for completeness, a couple of Kendo UI hybrid widgets are introduced—NavBar and TabStip. Note that they are also configured with the simple data-role attribute. Now that the application layout is defined, you need to define at least one view to be displayed when the application loads. Most apps have multiple views. However, start with the simple configuration from the example below. This example uses the data-role attribute to define your view, and the data-layout attribute to tell your view which layout template to use. You can add simple HTML or other Kendo UI widgets to the view. Instead of <a href="#home">Home</a>, you can also use <a href="#/">Home</a>. By definition, the #/ URL points to the first view, which is defined in the HTML file or the so-called root view. If you try to run the application now, you see a bunch of HTML, but nothing looks right yet. You need to take one more step to initialize the application. To make this HTML start looking like a mobile app, add the following line of script after your jQuery and Kendo UI script links, but before the closing body tag. This automatically initializes your Kendo UI hybrid application together with all widgets with data-role attributes. The following example demonstrates the full implementation of the described approach. If you have trouble seeing the application when working locally, make sure all of your script and CSS resources are loading without error by using the browser developer tools. Some browsers, such as Chrome, block the loading of external resources if you load your page using the file:// protocol. Instead, test your pages using local web server (localhost) or a browser that does not restrict local resources, such as Firefox. Now that you have a basic Kendo UI hybrid app structure setup, begin adding more views to your application. Multiple views can be defined in the same file or in separate HTML files. For larger applications, maintaining views in separate files during development is preferred. To add a second view to your app, create a new page called about.html with the content shown in the example below. Note that this page does not redefine references to the Kendo UI script or CSS resources. This page requires minimal markup. When the Kendo UI hybrid application loads a remote view—a view defined in separate file—it looks for the first data-role="view" in the body element and discards the rest of the page. Enable your application to navigate to this page by updating the TabStrip, added previously, to include a navigation link for your external view. When Kendo UI encounters a link to an external view, it automatically loads and caches the view with Ajax and provides a seamless navigation experience. If you do not want a link in a navigational Kendo UI hybrid widget to be treated as a view, be sure to include the data-rel="external" attribute. If you want to maintain multiple views in a single page, just navigate the id of the view, as demonstrated below. Your navigation is now working, though all the views appear instantly with no animation transition. To give your application the native mobile feel, add a default transition for all views by modifying the Application initialization script in the way shown below. Now your application is looking and feeling native. When you initialize a Kendo UI hybrid Application, you have the option to force the platform rendering with a simple configuration option used in the Application constructor. When using this code, you effectively disable the adaptive rendering detection and manually tell the application how to render. Make sure you remove this setting before deploying your application if you want the adaptive rendering to work across platforms. Kendo UI relies on the UserAgent string to trigger different platform renderings. If a browser reports that it is a specific mobile device, the mobile application responds and provides the correct, device-specific rendering. Some desktop browsers, such as Google's Chrome, allow you to easily modify your user agent string, thereby allowing you to trick Kendo UI that your browser is a given mobile device. This helps you to quickly preview your application styling for different mobile platforms without changing any code. Open the Chrome Developer Tools (F12). In the Settings window that opens, check the Override User Agent box. This reveals a dropdown of pre-defined browsers and devices. Select the device you want to imitate or define your own. To undo this effect, uncheck the Override box. Of course, nothing replaces actual testing on mobile devices. In many cases, the Kendo UI mobile styles look better on devices than in desktop browsers. Make sure you test on an iPhone, Android, BlackBerry, or whatever devices you intend to support before deploying your application or when previewing application styles. Kendo UI automatic platform adapting is a huge time-saver, but you might want to customize the presentation of an application for specific platforms. When you want to take more control over the experience different devices provide, use the data-platform attribute. If you want to create styles for your application that are going to be applied to iOS devices only, create CSS rules as demonstrated below. This added degree of control makes it a cinch to precisely style apps for different target platforms. You can also target styles at specific device orientations. Kendo UI hybrid framework updates the orientation CSS class as the device position changes. To get a better understanding of how Kendo UI hybrid Application works, check the features provided by the application class.